3 Garnets & 2 Sapphires: The Paparazzi Found My Son . . . The Paparazzi Found My Son . . .
. . . Well, not really. One day when my husband and Jake were getting ready to leave taekwon do class, a stranger came up to them and said, "Hey, I know you!" He was pointing at Jake. Then the stranger ran up to the front desk and grabbed this to show them . . . 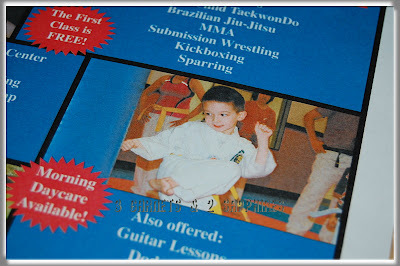 There had been a photographer taking photos of all the classes during past weeks and I guess Jake's was one of the three photos chosen to include in the studio's official promotional flyer. Jake was thrilled. I have to admit that it is pretty cool that his photo was chosen from among so many students. He must have good form (and I guess it didn't hurt that he's cute too).